With the increase in the amount of addiction-related deaths, there is a real need for more high-quality Substance Use Disorder (SUD) treatment programs. Ascension Recovery Services provides start-up consulting services for hospitals interested in developing residential treatment centers (RTC), partial hospitalization programs (PHP), intensive outpatient programs (IOP) and sober living homes (SLH), all of which are a crucial part of the continuum of care for SUD. RTC: Residential Treatment is the highest level of care for the treatment of SUD. This level of care often involves 30+ hours a week of treatment while patients live onsite. Usually, this level of care is for people with high severity SUD, living environments that are not conducive to recovery or co-occurring disorders. PHP: Care that is delivered through individual and group therapy a minimum of 20 hours or more a week. The purpose of PHP is to provide a higher level of care than regular outpatient treatment but does not require a residential or inpatient stay. Ideally, a patient steps down from PHP to IOP as they meet treatment goals and no longer require the PHP level of care. IOP: Care that is delivered through individual and group therapy three hours a day for three days a week. Individuals maintain family and work responsibilities while moving forward in recovery. IOP treatment is recommended for a minimum of 90 days. SLH: Sober Living Homes offer a safe haven to people in recovery from SUD. These structured living environments can help people strengthen their recovery following treatment. Sober Living Homes are a pivotal part of the recovery process and extremely important to the long-term recovery of those who have gone through treatment for SUD. Treatment programs may include: Medication-Assisted Treatment (MAT) as well as individual, group and family therapy. Now is the time to offer life-saving treatment. Contact Ascension Recovery Services to find out how. Ascension guides its hospital clients from the research and planning phase through opening the doors of your facility. With an accelerated development process, smooth opening and a solid operating model, we help you start making a significant, positive impact on community health in your area. 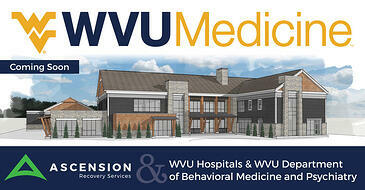 Ascension is proud to work with WVU Medicine (WVU Hospitals and WVU Department of Behavioral Medicine and Psychiatry) to bring a new residential drug and alcohol treatment center to Morgantown, West Virginia. This treatment center is being partially funded by a $1 million grant through the Ryan Brown Fund that will go toward enhancing program development for pregnant women and overdose survivors. Columbus Regional Hospital (CRH) is opening a Treatment and Support Center (TASC) to increase access to care for people suffering from SUD in Columbus, Indiana, to include Region 9, the 10-county region currently served by CRH. TASC will provide SUD treatment services designed to increase health and wellness through remediation of substance use disorders in its patients and by encouraging a lifestyle of recovery following treatment. PROACT is dedicated to reducing the impact of addiction in the West Virginia communities by providing comprehensive assessment, education, intervention and treatment solutions in a single accessible service hub. Have you hit a roadblock during the development of your residential treatment center? We can help. During the first phase, we will conduct a feasibility study and market analysis to determine the most desirable location for the residential treatment center. We will also consider the type of program to offer by researching potential payers, target populations, competition and state and local regulations / codes. A thorough analysis by our team of experts during this phase is crucial to establishing a successful program. There are many treatment programs in existence and more coming to market. It is imperative to know what is in your area and how you will differentiate yourself in order to better serve the population by establishing a long-term financially-viable facility. Ascension Recovery Services is accustomed to working with hospitals to develop a financial model that works within the hospital budget. Hospitals usually charge based on “fee for service” billing. SUD treatment is unique. Reimbursement for IOP’s and PHP’s is based on a “bundled rate” payment instead of “fee for service.” We work on creating a comprehensive program that will receive the highest bundled rate. We work with payer contracting departments within the hospital systems to establish contracts with multiple insurance companies. During Phase Two, we begin by developing a budget based on the hospital’s goals and financial tolerability. Start-up capital is usually comprised of cash and financing activities, with a goal of recuperating capital contributions through operating activities in the first couple of years. We will also assist the hospital with setting up the appropriate business structure and will further investigate the regulations and relevant state codes to ensure programmatic compliance. Ascension Recovery Services can assist with researching and applying for grant funding. Grants support critical recovery initiatives, innovative research and more. Individual states and the federal government are currently pouring millions of dollars into treatment expansion. Ascension Recovery Services has written and received multiple state and federal treatment center grants. In 2018, we were awarded $2.6 million in grant funds. We can collaborate with your hospital when writing the grant to ensure the best odds of grant approval. If your hospital does not possess a behavioral health license, we can help you acquire one. We will guide the application process, including best practice recommendations for communicating with state licensure bodies to alert them of the plans for the new facility. Support will be provided if there is a need to file for a Certificate of Need (CON) or exemption. We will work with you to complete all licensure applications and keep the state aware of all plans as we move forward to meet all applicable health and safety codes. The clinical program of the residential treatment center will be intentionally designed to meet the licensing and regulatory requirements as well as the goals for treating guests of the center. For large hospitals who already have a license but want to provide residential treatment, we can assist with getting your new program added on and attached to your existing license. Ascension offers material resources and best practices to guide in the development of a comprehensive policies and procedures manual that is specific to licensure requirements of the state where the facility will be located. The proforma financials will be refined throughout the development period as we recognize actual expenses, negotiate rates with various insurers, establish staff salaries, etc. Ascension also has partnerships with leading industry firms specializing in logo design, branding and marketing services (website development, marketing strategy, SEO, pay-per-click (PPC), social media, etc.). These partnerships equate to significantly reduced rates due to existing synergies and makes Ascension a one-stop-shop for full business startup support. During Phase Three, we will execute on our facility (property) decision made in Phase Two to either purchase, construct, lease or establish a public-private partnership. Should the owner wish to build the facility, Ascension offers property development services through our partner organization. In previous engagements, we have purchased the land, hired the architects, engineers, commercial builders and fully managed the construction of the treatment center from start to finish. We will borrow the money and finance the project so you don’t have a large capital expense at project order. Should the owner choose to lease, build themselves or utilize existing space, Ascension will assist the architect and general construction contractor in the design and build of the facility and environment. Effective December 15, 2018 (public entities), or December 15, 2019 (private entities), leases with terms longer than one year must appear on an entity’s balance sheet as both an asset and a liability. Other than providing a right of use, operating leases generally have little to no value as a financial asset to an entity but become a substantial financial liability on that entity’s balance sheet. This “lease liability” will negatively impact an entity’s existing and future loan covenants, ability to borrow, credit rating and ability to utilize existing capital due to increased liability or debt on the entity’s balance sheet. In short, the lease liability caused by the FASB Standards makes your entity appear less financially healthy to existing and potential lenders. Ascension has a partnership with a commercial real estate development company that has been in business more than 35 years and has developed more than $400 million in commercial real estate of which $340 million is in Higher Education and Healthcare. Through this partnership and consultation with legal, tax, accounting and financial experts, we have developed a solution to the issues presented by the FASB Standards. This solution should allow your entity to control real estate, design its facility and operate its project within a cooperatively-developed budget and plan, without creating onerous financial liability or impairing its balance sheet. Project remains off balance sheet, similar to current financial treatment of leases, protecting your capital and borrowing capacity, now and in the future. The Developer’s Off-Balance Sheet Structure resolves the FASB Standards issue, provides our development expertise, gives you certain operational control and provides additional benefits not available via traditional commercial leases. Ascension understands that addiction recovery is not a one size fits all approach, and we will be developing a program that provides a menu of evidence-based practice. 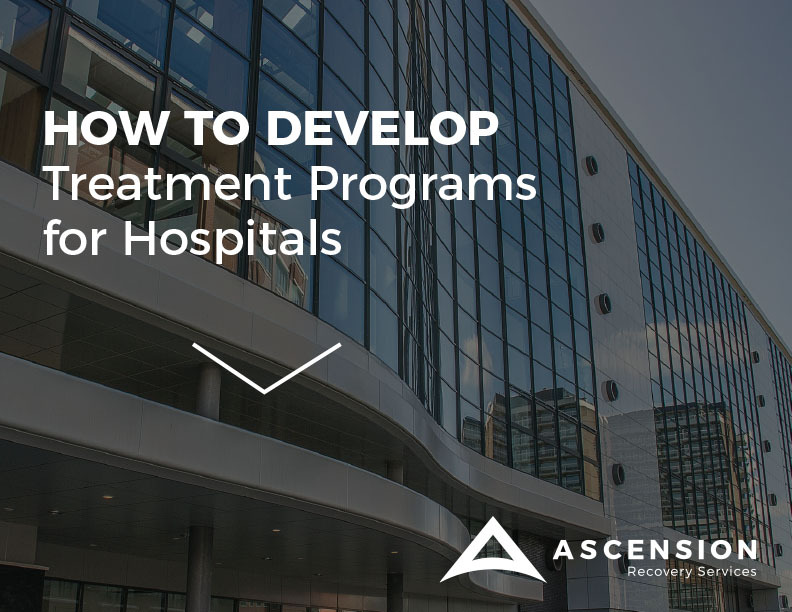 Ascension offers expertise and support to simplify and accelerate development of program materials, policy and procedure manuals and design of the patient’s daily schedule and curriculum. Ascension will assist in developing other program materials such as the mission statement, code of conduct, employee handbook and referral package for potential patients. We can also work with the hospital’s existing Electronic Medical Records (EMR) to integrate the new treatment program in the most efficient manner. Our team will guide you through staff recruiting, interviewing, selection and training. We can advise on compensation for practitioners and other staff to ensure that they work within the overall budget. The staff may be comprised of but not limited to Addiction Specialists, Psychiatrists, Psychologists, LPCs, LCSWs, LPNs, RNs and non-clinical staff to include Chemical Dependency Technicians/Peer Recovery Coaches and volunteers. The staff will be the fabric of the center’s community and must be well versed in its mission. Ascension has experience working with hospital Vice Presidents, Clinical Nurse Specialists, Directors, Chief Medical Officers, Managers and more. Ascension’s industry leading marketing partners offer logo design and marketing of residential treatment facilities to assist with the branding and marketing of the new program. We work with the logo designer and marketing agency to develop a brand and image consistent with the goals developed in the previous phases. Marketing efforts are led by the agency and guided by Ascension. Ascension assists in the creation of a website and marketing materials by providing a draft of mutually agreeable content for the website and marketing materials. Together, Ascension and our partner agency present an overall strategic marketing effort to reach appropriate audiences for building and maintaining patient census. Ascension will assist you in researching applicable grants that can support the treatment center. The grant process follows a direct lifecycle that includes creating the funding opportunity, applying, making award decisions and successfully executing the award. There are grant writers out there who simply write grants in order to get paid. By hiring Ascension, you have better odds of grant success. We do not apply for grants we do not think we’ll get. We take the time to decide what is best for your organization. Ascension will assist in establishing a research component to the center to document evidence-based practices and outcomes. This research will be used to publish articles in popular media and journals, which will increase the credibility of the center as a world-class treatment facility. Data and outcomes will be analyzed to ensure that your program is reaching its specific objectives and goals. The data we collect will also be used to justify further state and federal grant funding. For WVU Medicine, Ascension has completed the feasibility study and market analysis, budget and proforma financial analysis, development of the business plan and financial model, creation of the staffing model, licensure plan and strategy, clinical programming, credentialing and full integration into WVU’s EPIC software, marketing and grant writing support, along with a full plan for opening and operational excellence after doors are open. We are also assisting with the development of the real estate by financing the construction of the facility, hiring the architect, engineer, general contractor and overseeing the construction process through our partnership with a commercial real estate developer. The initiation and development of SUD-focused efforts have occurred in all of the PROACT partner facilities at Cabell Huntington Hospital, St. Mary’s Medical Center and Marshall Health for many years. The addition of resources from Valley Health and Thomas Health have served to complement these efforts. We are working directly with Cabell Huntington Hospital, Marshall Health and the PROACT program director to develop an IOP that will complement the already incredible services to be offered at PROACT. We have also assisted with grant writing support and business planning and strategy for expansion to other areas. The Treatment and Support Center at Columbus Regional Health will operate as a triage center for addiction-related immediate health needs including, addiction triage, Medication Assisted Treatment (MAT), PHP, IOP, individual therapy, group therapy, referral for job placement and workplace monitoring, SLH and Peer Recovery Coach (PRC) services. We can work with your hospital in developing the right program for your community so you are better equipped to address the rise of SUD, help people and ultimately, save lives. Ascension offers management agreements to help the hospital ensure they meet the desired financial and clinical outcomes as well as operational excellence. Our management agreements include advising and assisting program managers / directors on all areas of the program to optimize performance. We are on site regularly to assist with this process. Our management agreements act as an insurance policy on the success of the new program. Developing a treatment facility can provide many challenges. It can take months of planning to execute effectively, and mistakes or missteps can be costly. These mistakes can end up costing tens to hundreds of thousands of dollars in lost revenue and can even delay the opening of your facility. From feasibility analysis and site selection, to program development and staffing, to marketing planning and community relations, our team has the experience and capabilities to effectively launch your new endeavor and build a healthier community. Take the first steps in starting a residential treatment center for your hospital. With the enormous increase in mental health and substance abuse issues in the U.S., residential treatment centers are more important than ever. These centers have full-time staff whose primary purpose is to treat addicted individuals using evidence-based techniques which have a high rate of success. A survey conducted by the Substance Abuse and Mental Health Services Administration found that as many as 90 percent of people who most need drug rehab do not receive it. More than 72,000 people died of drug overdoses in 2017, according to the National Institute on Drug Abuse. 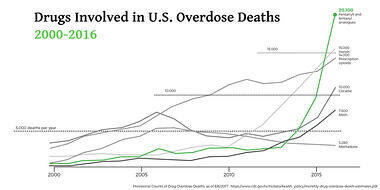 More people die from drug overdoses than from guns, traffic accidents and from falling. According to data collected by the Center for Disease Control (CDC), there have been increases in deadly overdoses for users of almost all drug types with massive increases in deaths by prescription opioids, heroin and fentanyl. This data provides a disturbing but accurate look into the scale of the drug overdose epidemic in the U.S. The need for more residential treatment centers is real and will be for some time.